Based on the statistics gathered from the first two games of the season, some conclusions can be reached. If you go by the numbers, The Argos will give the Ticats a good thrashing on Saturday – by a score of 34 – 19 (Oskee boo hoo). Here’s why. After two games, the Argos’ and Ticats’ scoring is similar (27 average points for TOR and 26 for HAM). Toronto’s defense allows only 27 points per game compared to Hamilton’s 41. 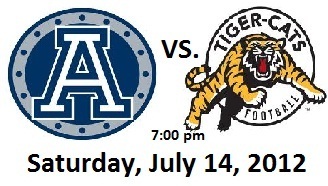 The Argos’ plus-minus-total is 0, while the Ticats’ is -15 therefore the Argos will win by 15 points. If you add seven of those points to the Argos average point total, they will score 27 + 7 = 34 points. If you take the other eight points off the average allowed, Hamilton will score 27 – 8 = 19 points. Thus, an end game score of 34 – 19 for Toronto. Here is how it will unfold! The Argos score twice as many field goals as touchdowns, so they will score 2 ½ converted TDs and 5 FG’s­(18 + 15 = 33 points – add a single for a punt in the end zone = 34). The Ticats, on the other hand, score twice as many TDs as FGs, so they will score two converted TDs and one FG (14 + 3 = 17 – add a safety touch= 19). The Argos have dominated the Ticats in big plays of 30 yards or more (12 for and 5 against vs 4 and 9 for the Tabbies). So, the Argos will have 6 plays of 30+ yards and the Ticats will have only 2. BTW, Dontrelle Inman leads the CFL in average gain per completion, at 31.5, so expect a couple of big plays from him. Both teams average about 100 yds rushing, but the Ticats allows an average of 165 yds rushing against, while the Argos stingy defence only allows an average of 65 yds against (a difference of 100 yds). So assume the Argos will rush for about 150 yds, while holding the Ticats to 50 yds. Speaking of rushing, in two games, Ricky Ray has run the ball 8 times compared to only 6 for Burris. Expect Ricky to outrush Henry. In the passing game, Ricky outpasses opponents by an average of 120 yds/game, while Henry outpasses by only 40. So look for Ricky to out pass Henry by 80 yds. Re: passing, did you know that Ricky has the 2nd highest completion % in CFL history (66.9%) (for QB’s with over 20,000 career yds). The leader is Dave Dickinson, but Ricky will have doubled him in career yds by the end of this year. If you think Ricky’s production is slipping, think again. This year he is averaging 74.7%. So there you have it – a detailed description of exactly what is going to happen on Saturday. Unless of course, the unexpected happens. Oh, yeah, this is the CFL. Better watch the game just in case.